What happens when the limb of the Moon passes in front of a distant star? What should we expect to see? Obviously, the star changes from bright (before the limb comes close) to invisible (after it is completely hidden by the limb), but if we could measure its intensity very carefully, what details might we expect to see? I will attempt to give a very basic introduction to the topic in this document, together with some simple examples which may serve to provide a flavor of the sort of phenomena one might expect in real life. Those who are interested in the details should probably consult a university textbook on optics. I will mention several complicating factors, but treat none in great detail. I'd like to thank Roger Easton, of RIT's Center for Imaging Sciences, for his advice and guidance on this problem. Thanks also to Brian Loader for catching an error in the horizontal scale of graphs in the section on partially resolved disks. But this time, the fringes will not have a constant spacing, and the mathematical formula required to calculate their location and amplitude will not be so easy; moreover, as the Moon's limb moves through space, the pattern of fringes will glide across the ground. which I will denote by the lower-case letter b. This gives the characteristic spacing between fringes on the Earth's surface, and so can be compared with x, the distance on the surface away from the geometric shadow's edge. If we look at very large regions of the Earth, on scales x >> b, then the situation is simple: far from the geometric shadow's edge, for positive x the Earth's surface is uniformly bright; far within the geometric shadow, for negative x, the Earth's surface is completely dark. But in between, near the geometric shadow's edge on scales of meters or tens of meters, the brightness of the Earth's surface will vary in a complicated manner. Here I0 is some normalization factor which scales the entire pattern. I will fiddle with it throughout the examples herein to yield roughly the same overall intensity for all situations, since it is the relative variations in the signal with position that concern us. Note that one must add up the pieces of each integral BEFORE squaring the result. In the examples which follow, I performed numerical integration on a grid of stepsize 0.1 meter, considerably smaller than the characteristic length scale of 14 meters. I then tabulated the values of I(x) every 0.2 meters. Note that the intensity reaches a value of exactly one-quarter of its nominal value at the location of the geometric shadow's edge. If we zoom in on the first few fringes, we can see that the distance between each fringe decreases as we move away from the shadow's edge. We have so far considered the light from a star to be monochromatic: all of a single wavelength. However, real starlight is a mix of different wavelengths. How will that affect the observations of an occultation? In each of the polychromatic cases, I will approximate a true continuum of light by adding together contributions from 11 wavelengths uniformly spanning the passband. So, for example, the "narrow" case will be simulated as the sum of light of 500, 505, 510, 515, ..., 545, 550 nm. I give each contribution equal weight. In real life, stellar spectra would vary significantly over the entire visible range, giving some wavelengths more weight than others. My simulations here therefore provide a sort of "worst case" set of examples. I suspect that a typical CCD-based video camera, observing a typical star through a typical atmosphere, yields a passband which lies somewhere between my "intermediate" and "wide" examples. So, what happens when we include light of more than a single wavelength? 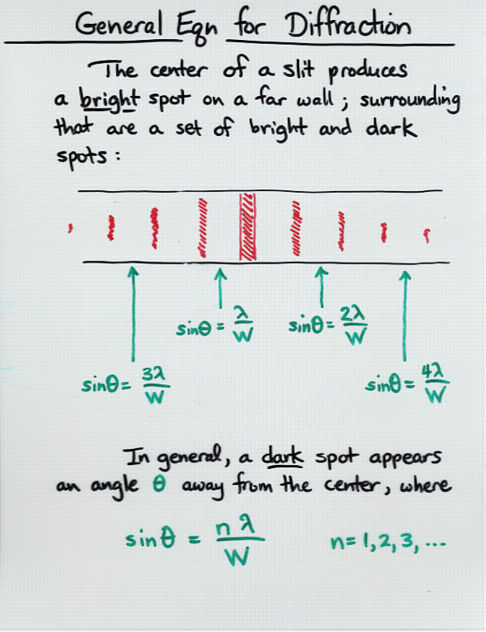 In a sense, we must add together the diffraction patterns of each wavelength; I will perform the addition within the complex integral (though the results of adding the results afterwards look very similar). Each wavelength of light will have its own characteristic linear fringe size on the ground. Thus, the diffraction fringes created by each wavelength will be slightly different in size. When we add the patterns together, it is reasonable to expect some cancellation of the diffraction fringes; that cancellation ought to become more more significant as the passband grows wider. Note that in all the cases, the first fringe is significantly brighter than the nominal intensity. As the passband grows, however, subsequent fringes very rapidly decline into uniformity. Note added Mar 21, 2018: It appears that I made a small error in the calculations in this section. Although the text states that the star in this example is 10 milliarcsec in diameter, it seems that my calculations used a disk only 5 milliarcsec in diameter; probably a confusion of radius and diameter. Sigh. Thanks to Tarek H. for his detective work! Although stars are so far away that they appear as point sources to the naked eye, some are close enough and large enough that their angular size produces detectable effects. Let us see what happens if the light source occulted by the Moon's limb is not a point source, but instead a very small disk. In real life, the apparent angular size of a star certainly does change with wavelength (generally growing with wavelength); moreover, the limbs of stars usually appear fainter than the central portions of their disks (an effect called "limb-darkening"). It is not too difficult to add these complications to the mathematical computations described below. There are (at least) two ways that we can modify our calculations to incorporate the non-zero angular size of a light source. They ought to (and do) produce the same results, but one method turns out to be a lot quicker in this simple case. We then create a second, smaller image, which I'll refer to as "the 2-D kernel". This should be the projection of the angular distribution of the light source onto the Earth's surface. We can now look at the intensity in this convolved picture as a function of distance from the shadow's edge to figure out the new appearance of the fringes. Two-dimensional convolutions involving large images can take quite a while. We can speed things up by doing the convolution in one dimension -- if we can figure out the proper 1-D kernel. The 1-D kernel must somehow express the shape of the real two-dimensional distribution of light, but in a 1-D manner. It turns out that the proper 1-D kernel can be calculated by breaking the disk into a series of slices, perpendicular to the direction in which the limb moves across the disk. Once we have the 1-D kernel, we can apply it to the 1-D fringe pattern. This convolution is much quicker than the two-dimensional version. In essence, we are smearing the 1-D fringe pattern over the width of the 1-D kernel. Good. Both methods show the same result: the first positive fringe is still far above the normal intensity level, but subsequent fringes have been smoothed almost to invisibility. For convenience, I'll use 1-D convolution to create the following illustrations. Let's now watch the fringe pattern change as the uniform disk grows larger and larger. Again, the setup is a wide optical passband and the Moon at its average distance. Warning! Warning! In order to measure the intensity of the first fringe accurately, one must sample the light faster than it varies signficantly. That means on timescales of milliseconds, for a typical lunar occultation (see the section below for the conversion of distance to time). Remember that video rate is not fast enough to resolve the fringes in a head-on occultation; a video system would integrate the changing light across one or two fringes, which would drastically decrease the amplitude of the first fringe and lead to a large over-estimate of the angular size of the star. For the rough purposes of this discussion, I will continue to assume that an effective value for characteristic size of the fringes b is about b = 14 meters. How fast will the Moon's limb move across the pattern? It depends on the angle at which the surface approaches the star. Let us denote the angle between the very leading edge of the Moon and the point on its limb which first touches the star by the letter a. Then the lunar limb will move across the star with a velocity which is V cos(a). For very rough purposes, the Moon's shadow and its entire fringe pattern will glide across the Earth's surface at about 1000 meters per second; that's not too hard to remember. One relatively simple way to incorporate these factors is to use a good planetarium program to measure the Moon's angular motion in the sky as seen from the observing location for, say, an hour before the occultation to an hour after the occultation. One can use the difference in position to calculate the apparent angular motion of the Moon relative to the star, and use that apparent angular motion times the Earth-Moon distance L at that time to calculate the linear speed V of the fringes across the observing site. Recall that for our "typical" setup, the characteristic angular size of the fringe pattern is about b = 14 meters. So, if a star lies directly in the Moon's path, and is covered by the very leading edge of the limb, the first fringes will zip past in very roughly (14 m)/(1000 m/s) = 0.014 seconds. This is less than the duration of a single video frame. We must conclude that ordinary video cameras will not resolve the fringes in a direct lunar occultation. In order to calculate the measurements made by a video camera, one would have to integrate the intensity over the duration of a video frame; in other words, break up the fringe pattern into chunks of size N meters, where "N" corresponds to the speed of the fringe pattern times the duration of a video frame (i.e. 1/30 of a second). There would be some ambiguity in exactly where the bins should start, so one would have to run several models and see which fit the video record best. So, for example, if a = 87 degrees, then the ground speed slows to only about 52 m/s, and the first few fringes will each take roughly 0.27 seconds = 8 video frames to pass. Warning! Warning! Danger, Will Robinson! It may not be a simple matter to compare actual video measurements to these theoretical predictions if the recording procedure introduces a non-linear response. For example, if the uncovered star saturates the video camera, then the recorded brightness will not appear to drop as soon as the real brightness does begin to decrease. Even if the camera does convert the starlight into a video signal in the proper linear fashion, that signal may not be recorded properly on a videotape. Finally, the procedure by which one analyzes the recorded movie -- whether judging the brightness by eye, or via the diameter of the star's image on a monitor, or by digitizing each frame and integrating the light through an aperture -- may introduce additional non-linear effects. The bottom line is that there are several mechanisms by which the true intensity of the star may be distorted. Most of these mechanisms act to reduce the dynamic range of the measurements, compressing the range between maximum light and minimum light and decreasing the time over which the change takes place. There is another issue which also acts to decrease artificially the durations of recorded events: background noise. The graph above shows the integrated light from a star decreasing to a value of exactly zero. A real instrument may have a "noise floor" caused by variations in the background value, fluctuations in voltage, atmospheric distortion, and so forth. In that case, when the star's light drops to the level of the noise floor, it effectively disappears ... before the light REALLY reaches a level of zero. For example, imagine a case in which we are monitoring a very faint star during an occultation. Suppose that we look at a truly blank region of the sky and measure a signal B. Suppose further that the noise fluctuations are of size +/- s, meaning that these measurements of the blank sky range between B - s and B + s. Now, when we look at the unocculted star, suppose that it is so faint that its integrated signal I is just twice as large as the scatter in the measurements: I = 2 s. Our measurements of the light coming from its area of the frame (including the background) will have an average value B + 2 s ; in other words, we barely detect it above the noise. As the Moon's limb approaches, and then begins to cover the diffraction pattern of the star, the star's light decreases. As soon as it drops to half its original, unocculted value, to I/2 = s, the total light measurement at its position will fall to B + s, and we will be unable to distinguish it from a random fluctuation in the background sky. Both factors act to make the measured duration SHORTER than the theoretical duration. Note that if two observers standing side-by-side have equipment with significantly different characteristics (saturation level, background noise, etc. ), they may derive rather different durations for the very same event. Figure 1 from Photoelectric observations of lunar occultations by Fekel et al., AJ 85, 490 (1980). Step-like features are clear signs that the star being occulted is a binary. One can use the delay between the two drops in brightness to figure out the angular distance between the components, and the amplitude of the step to figure out the relative brightness of the components. Finally, let's look briefly at a factor which can be most important in practice: can one measure the signal from a star adequately at video (or higher) rates to see any of these diffraction features? We can do a very rough estimate here. You may think that the number of photons is still large, even for a star of magnitude 10, but remember that the background will also be producing photons. If we were looking at a star isolated in a featureless background on a clear night, a typical sky brightness might be (mag 19 per square arcsecond), corresponding to about 13 detected photons per second per square arcsecond of background. For a typical small-telescope aperture radius R = 3 arcsec, the background underneath the star has an area of about 28 square arcseconds, meaning a sky contribution of about 370 photons per second, or 0.37 photons per millisecond; negligible, compared to the signal from even a tenth magnitude star. Unfortunately, the Moon tends to brighten the skies around it considerably. I do not have any real data on the brightness of the unlit surface of the Moon, but I'd be willing to bet that scattered light from the lit portion of the lunar surface will increase the background enough to drown out the signal from a faint star. Lunar occultations of Praesepe. II - Massachusetts by Peterson et al., AJ 98, 2156 (1989). KPNO lunar occultation summary. I by Schmidtke and Africano, AJ 89, 1371 (1984). See also other papers in this series. Model-independent retrieval of brightness profiles from lunar occultation lightcurves in the near infrared domain by Richichi, A&A 226, 366 (1989). Richichi has done a lot of work in this field. Lunar occultation angular diameter measurements. by Beavers et al., AJ 85, 1505 (1980). Angular diameters by the lunar occultation technique. III by Ridgway et al., AJ 85, 1496 (1980). Restoration of lunar occulation scans by von der Heide, A&A 89, 220 (1980), provides a simple technique to recover the original shape of an occulted light source. A new method of deconvolution and its application to lunar occultations by Subrahmanya, A&A 89, 132 (1980), provides another technique for the same purpose. Photoelectric observations of lunar occultations by Fekel et al., AJ 85, 490 (1980). Photoelectric measurement of lunar occultations. I. The process. by Nather and Evans, AJ, 75, 575 (1970), provides a nice overview of the theory involved in deriving stellar parameters from lunar occultations. A document describing Fresnel fringes in stellar occultations, written by Dave Herald. You can find it in the Files section of the Yahoogroups "Diffraction" group. Here's a new idea: using occultations of a compact radio source to determine the size of an asteroid!